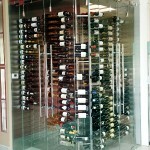 When you’re searching for custom wine cellars or wine cellar racks for your personalized home wine cellar; we can help! 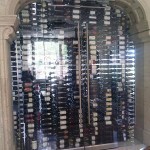 We offer completely custom wine cellar design, fabricate it ourselves, and install it anywhere in the valley. Our services are available in Phoenix, Scottsdale, Mesa, Chandler, Gilbert, Glendale, or any other city in the valley. We are proud to install the style you want from modern wine cellars to traditional styled storage, we will help you set the mood and store you wine in style. By installing a custom wine cellar your collection will be stored in an beautifully appointed, organized, and safe method. Proper storage helps guard the wine’s value and flavor as it ages and continues to mature. Collectible winds from both established and emerging vineyards develop more balanced flavor, complexity, and character when they are properly stored. Our design team specializes in transforming a corner, basement, or room of your commercial or residential property into the shiny gem of a wine storage and or tasting room you have been dreaming of. Whether you need a small purely functional storage area or you want to have a large sitting room with wine storage, wine glass shelving, and all of the trimmings, we can custom build your wine cellar to fit your preferences, needs, and budget. We have all the tools, knowledge, and experience to create wine storage which will beautifully display your collection, protect your wine, and make it easier to find the vintner, vineyard, grape variant, or year that you are craving. We build custom wine cellars for restaurants, homeowners, interior designers, and general contractors alike. 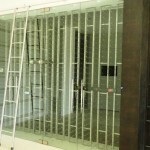 Let us help with your Phoenix custom wine cellar design, fabrication, and installation. Having a custom wine cellar in your home embellishes your residence with unmistakable refinement and affluence. In addition to beautifully displaying and organizing your wine our wine cellars help protect the wine. Having a custom wine cellar installed in your Phoenix home is easy with our highly skilled design team. We come to your home, take exact measurements, and listen to all of your wishes. Restaurants or wine dealers will simply sell more wine when it is displayed properly and protected from heat, sunlight, and vibration. 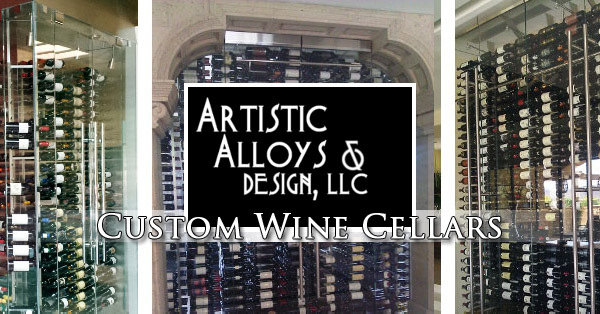 Having Artistic Alloy custom design and build your wine storage will help your wines age better at your location and be ready for your customers. We will be able to help you maximize your storage, display your wine more aesthetically, and store your wine more safely. With your design in hand we custom fabricate your wine cellars elements which will become your wine cellar. All of our work is made to be durable, visually stunning, and strong for your business or home. The majority of the components will be made at our shop and then brought to your property for final assembly. Our expert fabrication and installation team has a wealth of knowledge and experience in fabrication and can create the look and functionality you desire. From the traditional to the ultra modern we fabricate wine cellars which do more than safely allow your wine to age, yet make your collection a focal point in your home or business. Wine cellar doors are the introduction to your prized wine collection. The door should embody the pride and refinement of your home, wine collection, and own particular personal tastes. 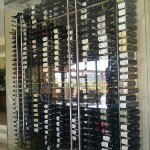 The number of bottles and how well they are stored is defined by the wine cellar racks. The position they hold the wine along with cancelling vibration affects how the wine ages and will taste. Today wine cellars in homes and businesses are more than just a dark room in the basement where wine can age, it is a symbol of refinement and can be a great setting for social gatherings or relaxing after a hard day. Elements can be added to the design of your wine cellar that include monograms, business logos, or whichever custom fabricated ornamentation you wish. Out wine cellars help regulate the temperature and humitity which guard your wine’s health but also fabricated artistic elements such as custom racks, doors, door handles, or any other accent you wish to set your wine cellar apart. Your wine collection is an investment, invest in a wine cellar which displays your collection in a safe, organized, and beautiful way. It will make collecting, owning, and even selling wine from your home or business more fun and profitable. Give us a call to set up your appointment for us to visit your space and listen to your wishes to start the custom designed wine cellar of your dreams.